It's happened to almost everyone: you're driving on the freeway and suddenly your exit comes out of nowhere. "From the I-8 to the 805, that's the hard one, going West," said George Langevin of Kearny Mesa. Between looking for your exit sign when you're driving and navigating your GPS, it can be confusing, making you have to look all over the place. "People make the last minute lane changes and sometimes they get in accidents," said Gerard Chadergian, division chief of traffic operations for Caltrans, District 11. That's why Caltrans has put giant markers along the pavement to help drivers. "It's in front of your line of sight so as you're driving and you see your signs it will also be right in front of you," added Chadergian. The markers have been tested and will not fade or become slippery when it rains, Caltrans added. "We actually got a lot of comments from the public that this was easy to understand and clear," said Chadergian. 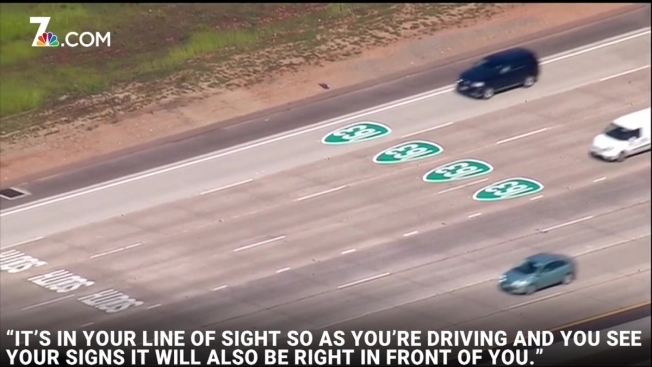 Now that drivers are on board with the markers, they will be put on other highways all over California. "I did see some on the ground on the I-8," said Langevin. "It was helpful. You look down and you know you're in the correct lane."